URI The Surgical Strike enters 100 Crore Club and it is the first Blockbuster film of 2019. The Vicky Kaushal led film has crossed around 108 crore at the box office in 10 days. The film has scored a huge second weekend and it is infact higher than the first weekend at the box office. . It is rare to find a blockbuster in the month of January especially for films released in the first couple of weeks at the January. 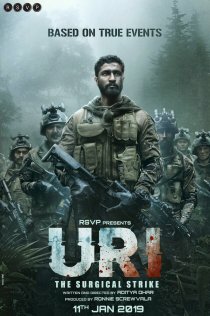 URI has surprisingly done exceptional business and the film is set for a long run at the box office. The 150 crore mark should be breached in the third week at the box office going by the current trends. The film has also busted the myth that early January releases don't work as it has scored handsomely at the box office. The patriotism angled coupled up with action driven narrative has found an acceptance with the audience and therefore, the film is on an uninterrupted run at the box office. Manikarnika might be impacted by URI at multiplexes in Tier 2 centers as URI is doing quite well there and it will retain good screens in the third week too. URI having become a blockbuster in just 10 days, has made the industry and trade ecstatic and positive at the start of 2019 itself and they are hoping that the trend continues at the box office.